I Had A Dream ... And It Freaked Me Out! 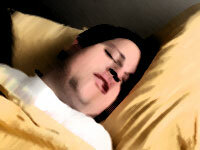 - The Lazy HouseHusband - Reflections Of A Stay-At-Home Dad! I Had A Dream … And It Freaked Me Out! I had a weird dream last night, which I believe relates directly to what I’m trying to achieve as a househusband and a stay-at-home father through this blog. I was so affected by this dream, that even though it woke me up at 1:47 am, I immediately got out of bed and started writing it down. I had a normal job (one of those things you have to get dressed up for and then sit in traffic for an hour to get to!) and was just arriving at work at the same time as some of my colleagues, when all of a sudden a bunch of guys jumped out of nowhere and forced us to get into the back of a truck. The kidnappers then drove us to a place full of large rooms. We were told to get out and each one of us were sent to a separate room. The kidnappers then left. I was immediately surprised to see that not only could I leave my room and go to the rooms of my other colleagues, but the rooms had working telephones in them. I became suspicious of this and immediately ran over to warn some of my colleagues not to use the telephones, as they were probably bugged. I then noticed that the hijackers had not taken away my cellphone. Knowing that my cellphone calls could not be monitored, I started dialling emergency services. While the call was being made, I also spotted an open window leading to the outside of the building, so I got out through the window and started looking for signs that might help me recognize where I was. A female voice answered the emergency number. After giving her my full name, I begged her to send over someone to rescue me and my colleagues. She asked me where I was and I told her I didn’t really know, but that it looked like some kind of hospital complex. While I was on the phone with the emergency operator, a policeman arrived. I immediately saw through the disguise (he wasn’t a policeman at all … he was one of them!) and started yelling at him to stay away from me. I then got back on the phone and asked the operator if she heard the exchange I had just had with the “fake” policeman. She confirmed that she had heard it all. I then started begging her again to send someone over to rescue us. However, realizing that I had no address to give her, I simply told her that I had to get away and said goodbye. She said “ok” and then added “congratulations” before hanging up, which I found really strange. I then started walking away quickly, and the policeman followed me. Trying to lose him, I ran into a side passage through one of the buildings and came to a dead end, filled with a bunch of people dressed as priests and nuns. Seizing the opportunity to unmask my pursuer in front of some witnesses, I then began yelling again at the policeman and told him that I knew he was a fake and that he was impersonating an officer of the law, but that he was really working for the kidnappers. Then, I noticed something really odd. All of the priests and nuns were crazy people. They were just “nutters” dressed as priests and nuns. I realized then, that I was in a mental hospice … an asylum for crazies. Here I was, a sane, rational guy, stuck in a mental institute, yelling paranoid, conspiratorial rantings at a policeman in front of a bunch of mentally-ill patients and calling emergency services, begging them to come and get me out. It was at this point of the dream that I woke up. As I lay in bed thinking about it for a moment, I wondered why I didn’t call someone that I knew, like my mother, for example, and then realized that it would be worse. My family already thinks I’m nuts – they’d probably be glad to see me committed to an institution! I glanced at the clock next to my bed and saw that it was 1:47 am. I debated for a few moments whether I should get out of bed and write the dream down, or just roll over and try to go back to sleep, hoping I would remember the details of the dream in the morning. A few seconds later, I got the connection between the dream and the reason why I have decided to create this blog, and so here I am writing my dream down. First, there’s the scene where I’m on my way to work in a normal job and then get hijacked and put in a large room by myself with access to technology (a working phone). This, to me, represents the move from a traditional male role of going to work in an office or external worksite, to a work-at-home environment. I think the fact that I was hijacked into this situation is significant, because although working at home suits me, it was more of an imposed decision on me, given our financial situation. After spending well over a month searching unsuccessfully for a new business consulting contract and realizing that time and money were running out quickly, we decided my wife should go back to work and I would stay home to look after the kids and keep working on my online businesses, which I had started building around two years ago. Next, is the part of the dream where this is not just happening to me, but to others too. According to social research and statistical results, more and more men are staying home. Although they have access to the world through technologies like the internet, email and phones, they are living and working mostly in an isolated environment (the large rooms). We can get out and leave the house anytime we want to (the open window), but when we do, we may come across to others as being slightly mad, which ties in with the final part of the dream, where I am asking people for help. I guess one reason for this, is because work-at-home and stay-at-home fathers, as a demographic representation of the overall population, are still a minority and so the “househusband” phenomenon is not yet well understood or fully accepted by the general majority. Also, I know that in my case, the fact that I’m dealing with an “Information Age” lifestyle (i.e. building automated online businesses that allow me to live and work from home) means that I spend half my day engrossed in advanced technological concepts and using jargon that sound like unintelligible gibberish to most people, and the other half of my day talking about things that my kids can relate to, like the good guys and bad guys in Disney movies and the funny adventures of Spongebob Squarepants and his friends in Bikini Bottom. In other words, there is really not many people I physically come across during the day who I feel can help me or that I can relate to, especially regarding work. Writing my thoughts in this blog is important to me, therefore, because not only is it helping me to personally understand the new role that has been thrust upon me by our family’s financial circumstances, but, more importantly, because if there are other househusbands or stay-at-home fathers out there who may be feeling isolated, or slightly disconnected from the normal social setting, then some of the thoughts I’m putting out here can hopefully be of some help. Have you had any weird dreams about living or working at home that you’d like to share? If so, feel free to use the comments section below. Once again, I welcome any contributions from other househusbands, and work-at-home or stay-at-home fathers. Hi, I’m not a ‘HouseHusband’ but I have recently been presented with the idea by my wife who thinks it would be better for the family financialy if she did more hours and I stayed home and looked after the house and kids. I have to admit the concept came as a bit of a shock, the idea that I could litteraly ‘stop working’ blows my mind. So I turned first to my greatest ally, the internet, and found your website. After reading about your dream, I wonder if becoming a househusband is realy the thing for me, it’s a hell of a choice isn’t it? on the one hand I’d get to spend more time with my two daughters who I barely see during the week as I’m a teacher in a private academy working all afternoon, with the added plus that I, well, I wouldn’t be working. On the other hand I am afraid that I would lose the little masculinity I have managed to scrape together over the years, being something of a pc nerd, plus I worry what affect it would have on my mind. I don’t have many friends I can talk to about it and would seriously welcome any sage words of advice you could offer. Even if I choose not to be a stay at home dad, I am still very encouraged by people like you who have the courage to break away from strict social conditioning and follow thier dreams.